Heya guys. 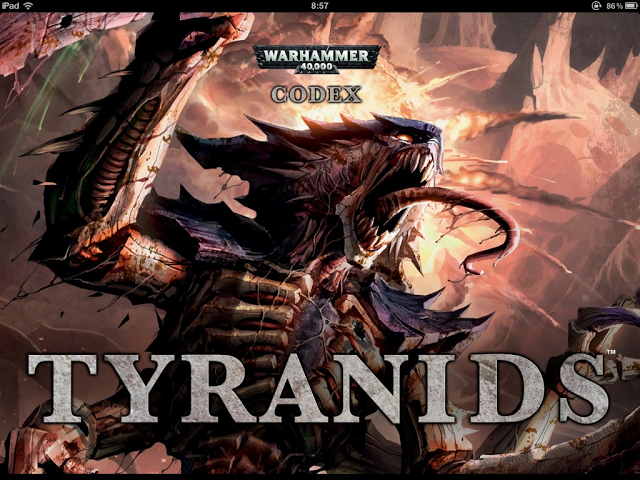 So the new Codex: Tyranids is finally out for sale, and as you might have read in my ast post, I have my print. After following several rumour sites, Warhammer 40.000 pages on facebook and such, I saw a lot of fellow Tyranids players complain about the new rules, burning the book before they even had them in their hands. It really got me a little negative about the codex without even myself having a print. Now, right after I came home from the GW near to me, I went straight ahead and started comparing the previous edition to the new codex, and there are some stuff I like, some I think it is a pity they got out, and stuff I simply dislike. Hive Tyrant: Previous codex, it started with a set of scything Talons and a Lash Whip and Bonesword, now with 2 sets of Scything Talons. Was, a Mastery Level 1 Psyker (following recent Errata), now Mastery Level 2. BS was 3, now 4. Old Adversary now gives only the Tyrant itself Preferred Enemy instead of all Tyranids within 6” of the Hive Tyrant. Went down 5 points. The Swarmlord: went up 5 points, Was a Mastery Level 2 Psyker, Now ML3, Standard Warlord trait (synaptic Lynchpin) but gives what the Swarmlord already had: 18” Synapse Range. Further no changes. Tyrant Guard Brood: This one changed quite a bit, in our favour. Costs went down with 10 points. Starts whith Scything Talons and Rending Claws are added to the profile. Now Tyrant Guards can exchange their Scything talons with not only Lash Whip and Bonesword, but also Crushing Claws, and now can also take Adrenal Glands and Toxin Sacs, and it got an extra Attack. Old One Eye: This is a surprising change. First of all, this one went from a Heavy Support character to HQ. Went 40 points down in cost, Thresher Scythe Tail biomorph added in profile (which gives an extra strength 4, ap4, rending melee attack). Special rules remain unchanged but Has it’s own Warlord Trait: Adaptive Biology, which gives him Feel No Pain of 5+ after he loses one or more unsaved Wounds. Tervigon: Went up 35 points. Now has Scything Talons standard in profile. Replacing these with Crushing Claws is 10 points cheaper. Cluster Spines instead of Stinger Salvo is no longer free, now costs 5 points. No further changes to it. Tyranid Prime: went up a staggering 45 points. No changes in profile. Now can take Flesh Hooks. Deathleaper: Another shift in Choices is the Deathleaper. Went from Elites to HQ. Stats remain unchanged. Now has Warlord Trait: Mind Eater, which gives Tyranids 2 extra Victory Points for every Independent Character the Deathleaper kills in combat. Went down 10 points in cost. Now has the Fear and Infiltrate special rules. Tyranid Warrior Brood: Stats, points cost and equipment remain the same. Now may also take Flesh Hooks. Genestealer Brood: Points, Stats, standard and add-able Equipment remain the same. Only now you can ADD a Broodlord for 60 points instead of UPGRADING a Genestealer. Broodlord knows only 1 standard Psychic Power. Termagant Brood: Went down 1 point, Adrenal glands and Toxin Sacs went up costing 1 point more, Devourer 1 point cheaper. Additionaly, now you need to take a full 30-model unit to make the Tervigon a troop choice. Hormagaunt Brood: Went down 1 point, stats and special rules remain the same, Toxin Sacs cost 1 point more. Ripper Swarm Brood: went up 3 points, Spinefists are 1 point cheaper, Toxin Sacs went 2 point up. Stats remain the same. In addition, Mycetic Spores have been deleted completely from the Codex, so no more Drop Army Lists :(. Hive Guard Brood: BS went up with 1, Went up 5 points in cost. New Shockcannon available, and can take Adrenal Glands and Toxin Sacs, which it could not in the previous edition. Lictor Brood: 15 points cheaper, Stats unchanged, now has Infiltrate and Fear. Zoantrope Brood: 10 points cheaper, now has the Brotherhood of Psykers and Psychic Brood (which allows Zoanthropes to fire blast markers of Warp Blast equal to the number of Zoanthropes in the Brood) Is now Mastery level 2 Psyker. Venomthrope Brood:10 Points cheaper, BS went down with 1. In addition to the Spore Cloud 5+ Cover Save, he also gives Tyranid units within 6” Shrouded special rule. Pyrovore Brood: 5 points cheaper, Wounds, Initiative and Attack all went up with 1. Now has W3, I2, A2. Tyranid Shrike Brood: 5 points cheaper, No real additional changes, except the ability to take Flesh Hooks. Ravener Brood: no longer has Move Through Cover and Acute Senses special rules. 1 attack less, but the Pair-Of-Weapons rule makes up for that. In addition, The Red Terror is back as a Unique Leader Beast in a Ravener Brood for 85 points. 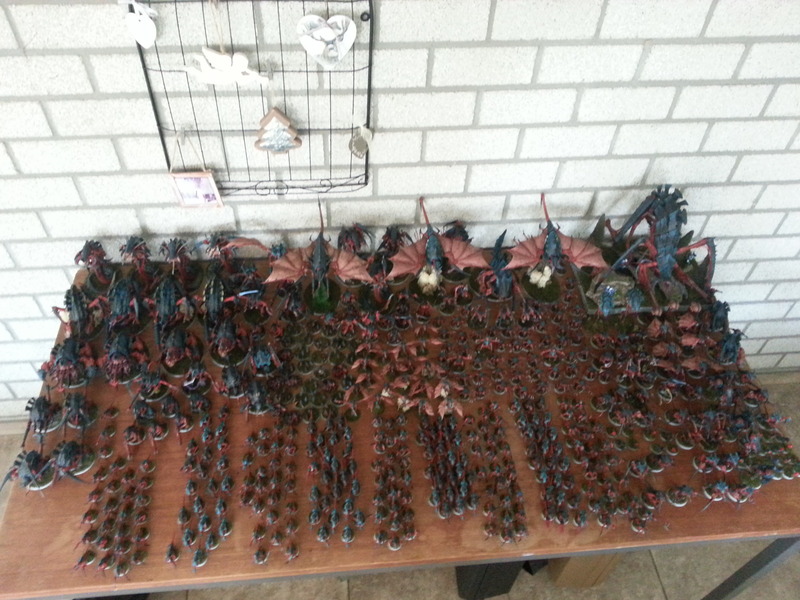 Only 1 may be taken per Tyranid Army. Sky-Slahes Swarm: went up 3 points cost. Stats remain the same. spinefists are 1 point cheaper, toxin sacs 1 point up. Gargoyle Brood: Points, Stats, equipment and special rules remain the same. Adrenal Glands and Toxin Sacs went up 1 point in cost. Has the new Instinctive behavior- Hunt. Harpy: 25 points cheaper, 1 Wound more (now 5 wounds) and 1 attack more (now 3 Attacks). has the new Instinctive behavior – Hunt. Spore Mine Cluster: went down 5 points per model. No ”Orbital Bombardment” special rule anymore, replaced by Deep Strike. Carnifex: is 40 point cheaper! Now Initiative 2, 1 Attack less, which the Pair-Of-Weapons rule makes up more than enough, and is able to take Tail weapons, like in 3rd edition codex. Biovore: 5 points cheaper, 1 wound more (now 3 wounds), 1 Attack more (now 2 Attacks) and 1 Initiative more (now Initiative 2). Trygon: 10 points cheaper, 1 attack less, which the Pair-Of-Weapons more than makes up for, and now can take Tail weapons which give an extra attack. Trygon Prime: Now has its’s own slot instead of being an upgrade option for the Trygon. Overall went down 10 points, 1 attack less, which the Pair-Of-Weapons more than makes up for, and now can take Tail weapons which give an extra attack. Bio-electric pulse and Containment Spines have been merged to 1 weapon which gives a a total of 12 shots, instead of the Containment Spines and Bio-Electric Pulse together giving 18. So a loss of 6 crucial shots. Mawloc: 30 points cheaper, Stats, equipment and special rules remain the same but because the Mawoc has 2 sets of scything talons, the Pair-Of-Weapons rule gives him 2 additional attack, and is able to add a Tail weapon, for a total of 6 attacks, which is better than the 3 standard attacks. Also his ”Terror from the Deep” special rule got better, using the Large Blast template twice if you fail to kill enemy models underneath the first time. Exocrine: new unit, no changes noteable. Tyrannofex: (don’t get startled) 75 Points CHEAPER!!!. Stats and standard equipment remain the same, but the standard Thorax Electroshock Grubs have been removed. Now available through the Thorax Biomorph list. Rupture Cannon points went up 15 points, Fleshborer Hive got 5 points cheaper, and lastly, has a lot more choice in Biomorphs. All in all, I think, looking at the units overall, they have gotten better. Nice Additions like the Red Terror and the new GW kits, fun changes in some of the model-specific special rules and some rules that make up for some losses like the loss of an attack or something like that. In the next post, I’ll be looing at changed special rules regarding how they effect units on the field. Finally, of reading rumours for months and after waiting a week after GW’s confirmation of the new Tyranids Codex and new models, I got my print of the Codex, along with the Tyranids Psychic Powers cards and the new Haruspex/Exocrine set. I have already built the Haruspex from the set. I’ll be basecoating it in a while and start painting it right after that. Now, all I have to do is test-play the new codex. I’m really excited and curious how the new rules work out. Is there anyone out there that has already battled with the new Codex: Tyranids? if so, let me know what you think about the new rules being played out and how it is better or worse from the previous edition Codex.